From left: Representative Walter Jones, Representative Stephen Lynch, and Representative Thomas Massie. WASHINGTON — It remains a hidden — and highly controversial — chapter of the official record of the 9/11 attacks: the 28 pages that were excised from an 800-page public report about what US spy agencies knew about the terrorist plot that killed nearly 3,000 people. 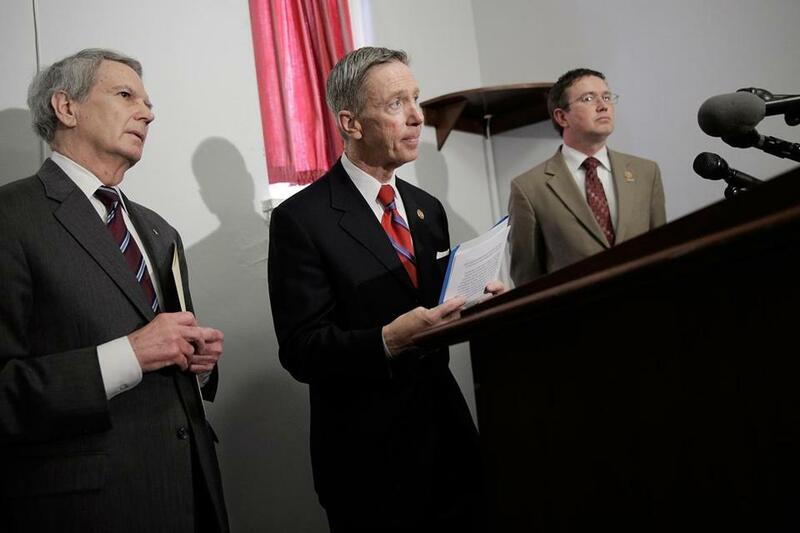 For Representative Stephen Lynch, a South Boston Democrat who has pored over them in a secure room in the US Capitol, declassifying the findings has been a goal for nearly a year — one he considers as urgent as ever. According to multiple people who have read it, the secret annex from a special congressional inquiry in 2002 reveals support for some of the 19 Al Qaeda hijackers from Saudi Arabia. Lynch, who with a Republican colleague has sponsored a resolution calling on the Obama administration to make the report public, said he believes the information has direct bearing on the new war against the Islamic State in Iraq and Syria and other militant Sunni Muslim groups that are believed to be drawing some of their funding from the same Arab states that America considers key allies. Shaking loose the information, however, is proving to be an uphill battle. In the meantime, the quest is making for some strange bedfellows. Lynch has become a hero of sorts to conspiracy theorists who assert US government complicity in the worst terrorist attacks in American history. Some of them, according to Lynch, show up at his town hall meetings to ask about the secret pages and interrupt the events to discuss their multiple theories about what really happened on 9/11, including that Israel was to blame for the terrorist attacks. One of these groups is the political action committee headed by longtime activist Lyndon LaRouche. LaRouche, the 92-year-old New Hampshire native whose anti-establishment movement has roots in the leftist activism of the 1960s, held a webcast last week about the issue (and for good measure called for the removal of the British monarchy and the impeachment of President Obama as the only way to save the world from imminent destruction). But on the issue of the infamous 28 pages, they are in lock step. And Lynch is not alone among establishment figures who want the full story about the government of Saudi Arabia and 9/11 to be disclosed. The cochairmen of the 9/11 commission that investigated the attacks have also called for the public release of the blacked-out pages. So has the cochair of the congressional inquiry that gathered the information from hundreds of secret government files and interviews with counter terrorism officials. “One of the remaining questions is whether the 19 hijackers acted alone or had external support,” said former senator Bob Graham, a Democrat from Florida who also chaired the Senate Intelligence Committee. Graham claims that the information contained in the 28 pages shows financial links between at least two of the hijackers and the Saudi Arabian embassy in Washington. “There is hard evidence in there that would directly implicate individuals,” added Lynch, without discussing the details because they remain classified. Graham said he believes keeping the pages secret amounts to “excessive deference to Saudi Arabia,” where all the hijackers were from. In response to a request by the White House earlier this year on behalf of Lynch, the director of national intelligence is reviewing whether the pages can be made public, according to a spokesman, Michael Birmingham. The Saudi government, through its Washington, D.C., public relations firm, did not respond to a request for comment. In the past it has insisted it has nothing to hide. But for Lynch and his supporters, Saudi government denials of involvement in 9/11 miss the point — which is whether rogue individuals inside Saudi Arabia or its extended royal family were and may still be supporting Al Qaeda-like groups. Bryan Bender can be reached at bryan.bender@globe.com. Follow him on Twitter @GlobeBender.